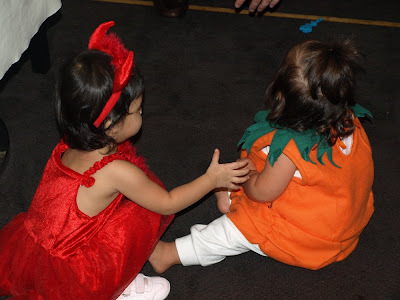 Natalie, Lauren and Ashley's Blog: Baby Hallowe'en Party! Today we had our Apr-Jun Mommies' Group baby Hallowe'en party. It was so much fun! Parents and babies all had a great time. This year, the party was held at Dakota Prime, a new steak restaurant and there was lots of yummy food, including truffle mac-n'-cheese which Natalie loved (she ate TWO servings!). 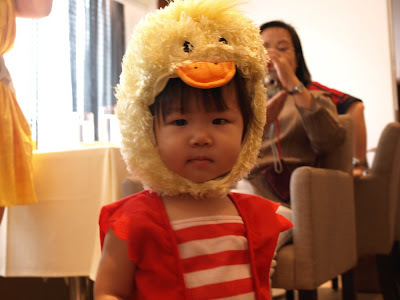 Natalie dressed up as one of her favourite animals... a duck! 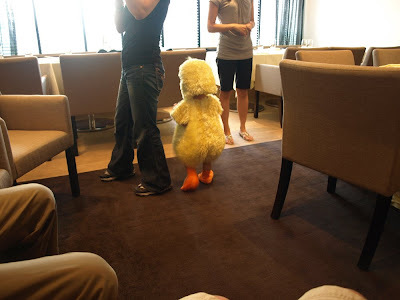 Here is Natalie the duck. The duck munching on a lady finger biscuit. 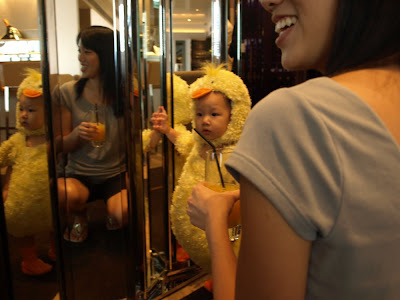 The duck admiring herself in the mirror and drinking diluted fresh mango juice. Other animals and costumes present included this cute (home-made!) snail. 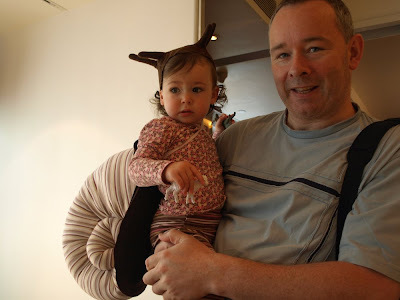 Here is Holly the snail and her daddy, Alastair. 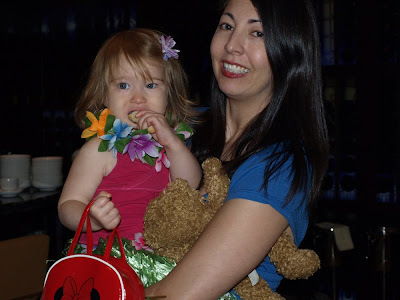 Here is hula-girl Stella with her mommy Katie. 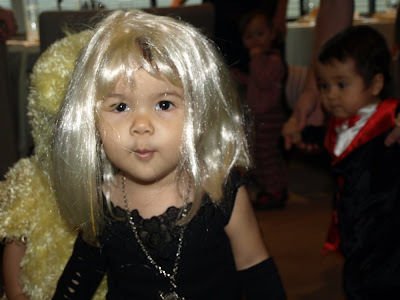 It was such a fun party, even Madonna Moorea showed up with her grandma Linda. There was also a little vampire Jamie who really bites! Here is Natalie trying to steal food from her friend the skeleton, Becky. Clara the pirate has to hold tight to her little pumpkin bag. Natalie kept trying to steal the gold coins and toys from it. Of course, she also put them back. 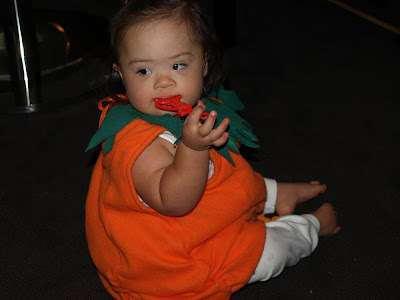 Here is cutie Pia the pumpkin munching on a toy. 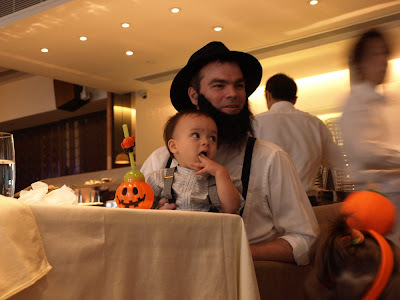 Here is Max the Amish boy sitting with his daddy Dave. Here is Summer the mummy. She has scary spiders and rats attached to her costume. Good thing they were stuck on the back where she couldn't see them. Here is a cute devil Nivana trying to shake hands with her friend Pia. A little later, we had some cross-breeds. Here is Clara the pirate with a duck head. The other babies LOVED Natalie's costume. Some of them who saw her opened their mouths in amazement and they all wanted to touch her. Here, Becky the skeleton is giving the duck a big hug. For more photos, see our "TheWangGang" flickr account here. HALARIOUS!!! 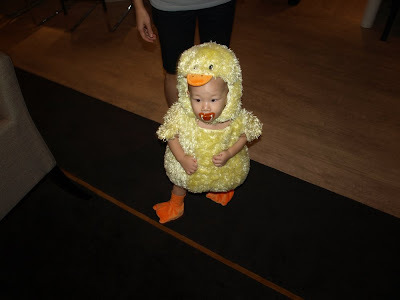 OMIGOD, the duck costume was a hit!! I'll use it next year for Victoria if you guys still have it! 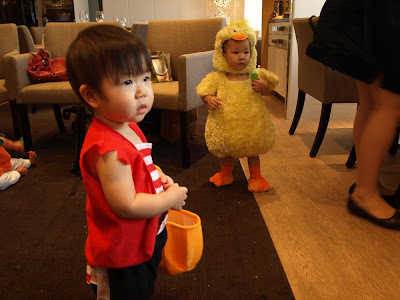 it seems like her costume was by far the cutest and biggest!! LOL and yes, I'm sure other kids thought she was a real duck so of course they would go hug her! LOL, adorable!!! All kids are fabulous. 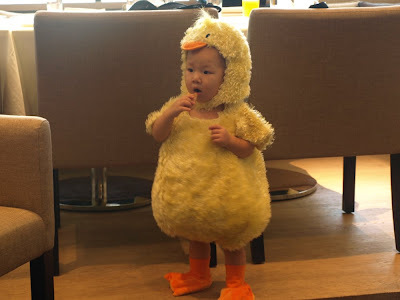 The Duck costume was awesome.